Green SiC is made from Silica sand and coke, and is extremely pure. Hexagonally shaped, it breaks into very sharp particles. How does Green Silicon Carbide differ from Black Silicon Carbide? Green SiC is harder than black, coming in at a 9.4 Mohs and 2600 on the Knoop scale. Green Silicon Carbide is also of a higher purity than Black Silicon Carbide. Green is often the media of choice when it comes wire sawing. Please use our Quote Request Form for wholesale price inquiries. UNLESS your application requires an extremely pure SiC, or a maximum hardness rating, then by default, Black SiC is preferred due to its more economic pricing, as well as availability. SiC has a modulus of elasticity of 410 GPa, with no decrease in strength up to 1600°C, and it does not melt at normal pressures but instead dissociates at 2700°C. Melting Point: Sublimes at 4892°F (2700°C) - it does not melt at normal pressures but instead dissociates at 2700°C. 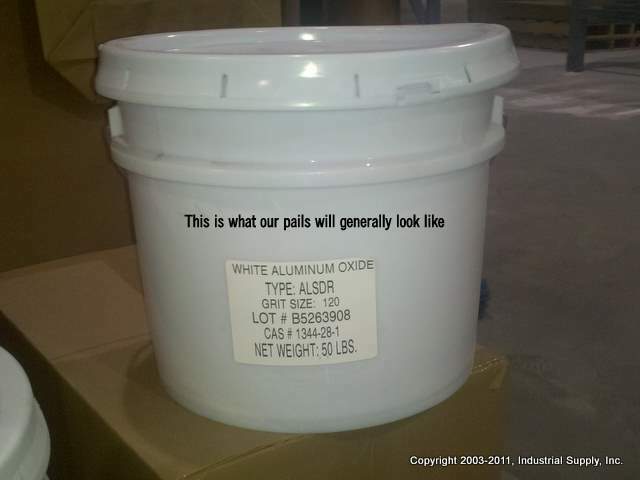 Default Packaging: Default packaging is in 50lb pails, or 300 lb fiber drums. Discount Pricing: Please use our Quote Request form to obtain custom pricing on larger quantities, with freight. Lead Time: 2-3 Business Days to date of shipping due to ISO Quality Control paperwork that we must complete prior to shipping. Retail 25 lb Box Discounts: Note that orders of 50lbs or more are generally shipped in a 5 gallon plastic pail or a 50lb box. They will not be shipped in 25lb boxes because this would increase freight costs. Discounts apply the more you order.